The Tasmanian devil is perhaps best known by its famous cartoon counterpart. While Looney Tunes' whirling dervish might seem indefatigable, in real life Australia's iconic carnivorous marsupial faces the serious threat of extinction. 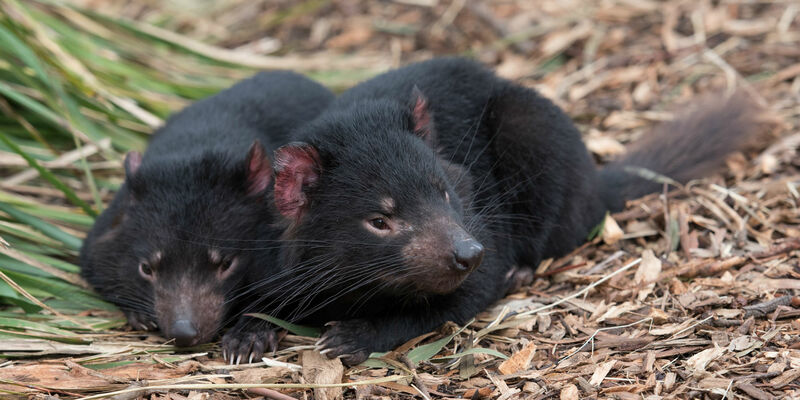 Over the last few decades, the Tasmanian devil’s population has been decimated by a highly transmissible cancer: the Devil Facial Tumour Disease (DFTD). Since it was first detected in 1996, DTFD has rapidly spread across the devils' population, decimating their numbers by up to 90 per cent in some areas. A team of researchers from the University of Canberra’s Institute for Applied Ecology hopes to prevent the animal’s extinction by creating a better understanding of the disease. Associate Professor and Australian Research Council Future Fellow Janine Deakin is part of that team. "Usually when someone gets a tumour, it stays within them and isn’t passed onto anyone else," Janine said. "In the case of the devils, they’re passing tumours on by biting one another. We want to predict whether it’s becoming more of a problem or less of a problem." A comparative genomics specialist, Janine has tracked the evolution of the devil facial tumour over the last seven years. By revealing the genetic origins of the tumour, and tracking changes in the genome over time, she hopes to uncover what drives the evolution of DTFD. The Tasmanian devil has had a difficult history. Known for its bad temper, it was once a popular species all over Australia. It became extinct in the mainland around 500 years ago, and 20 years ago could only be found in the Tasmanian wild. However, the facial tumour, which initially only affected one devil, now threatens the existence of the last community in the wild. Once infected, an animal dies within six months. "In one case, we had a strain of the tumour that was quite virulent, so it was killing the animals very quickly," Janine said. "We’ve since found that strain has died out, because it was killing the animals too quickly and wasn’t getting passed on as a result. There’s also a more recent strain that started in a male devil. This strain is supposed to be really rare, but we’ve had two show up in the same species over just a few decades." By observing the changes to the tumour genome, Janine will be able to determine whether the tumour is evolving to become less virulent to the Tasmanian devils, allowing them to ultimately survive and fight the disease. "The changes we’ve tracked are pretty significant. What we are seeing is that there’s a resistance building within the population, so devils might be able to survive." "That might signify that devils are starting to catch up in their evolution to the tumour." For Janine, the Institute’s research on Tasmanian devils holds a special place in her heart. Having always been interested in marsupials, the opportunity to research DFTD perfectly combined her interests with research that has a significant impact on the lives of animals. I’ve always been interested in marsupials. This is an opportunity where I can use my skills and my love for marsupials to do something fundamentally useful. There’s still a way to go with her current research; Janine wants to continue tracking the evolution of the tumour to understand why Tasmanian devils in particular are afflicted with this issue. "To have one strain, we could dismiss that as being an unlucky occurrence but two says to us that there’s something about devils that makes them more able to transmit these tumours." "Now, we’re looking for commonalities between the two different tumours, and we’ve noticed that the main chromosome that’s rearranged in both is the same chromosome." Seeds sown at Seeds of Change Conference 2019 were intended to encourage debate, build networks and stimulate fresh thinking around bridging the gender gap in the agricultural sector. Power in agriculture: Is gender identity the key? PhD candidate Jane Alver shares her thoughts on gender identity and its power in the agricultural sector ahead of the Seeds of Change Conference. University of Canberra Urban Planning expert and Chair of the ACT Climate Change Council Professor Barbara Norman shared her opinion on the evolution of Canberra and whether it is a blessing or curse. What makes Canberra such a liveable, lovable city? Urban planner Dr Sajeda Tuli created a knowledge cities index from 25 Australian cities. The Bush Capital was #3. Now, the 2019 Fulbright Scholar is going to gain knowledge from the US to see how we compare on an international scale.